1. Place raisins and dates in a small bowl and marinate with the cider vinegar and sweet wine overnight (do not refrigerate). 2. Rinse nuts and spread out on a large kitchen towel to dry about 15 minutes. in a food processor and pulse until coarsely ground. 4. Add grapes, apple, and marinated raisin-date mixture (with soaking liquid) to the processor and pulse until fairly smooth and well-blended. 5. 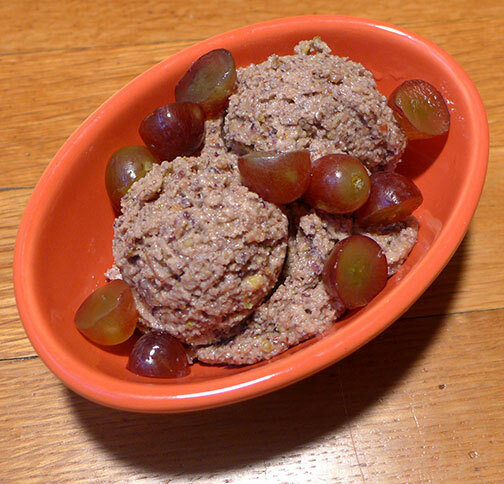 Serve immediately garnished with sliced red grapes, or refrigerate in container for up to 2 days. ← OUT with the OLD and in with the NEW: Time to throw out the old spices!